…but I sliced a loaf cake into squares. WHAT IS HAPPENING IN THE WORLD. Some people (…Eddie) are quite disturbed that I made a loaf cake and then sliced it into square bites. Instead of regular loaf slices. Like, the universe might explode because we ate a loaf cake in square form. My square-cutting was an experiment. First, the cake looked like it would be perfect if cut in half. Second, quick breads last approximately 23 seconds in this house. I mean, seriously, what IS it about a loaf of bread or cake that is cut into slices and then disappears an hour later? It’s like the slices just beg to be eaten while standing over the kitchen sink and before you know it, you’ve devoured three. BUT. When you cut the zucchini bread into squares, it almost makes it more satiating. Sure, of course, it doesn’t REALLY, but it’s like how you enjoy your food more when you sit down at the dinner table as opposed to standing at the counter while watching reruns of Friends. Question: does the term “reruns” even still exist, when pretty much everything is streaming at our fingertips at all times? Anyhoo. I love zucchini bread and figured that it had to be even better with a cinnamon sugar swirl in the center and a crumbly streusel on top. Let’s be real, what ISN’T better with a cinnamon sugar swirl in the center and a crumbly streusel on top?? Now that Max knows what cake is (he also thinks donuts are cake, but that’s neither here nor there), he spied this on the counter while it was cooling and just about lost it because he wanted a taste so badly. I underestimated his height and thought that it was out of site, but I was wrong and found myself struggling to distract him from the deliciousness that cooled up on the bar. I caved – and eventually cut a piece because even I couldn’t handle how wonderful the kitchen smelled without having another taste. It was still WARM. There was coffee to be made. Um, please note the below behind the scenes peek. Cake in the hair, love in the eyes. Preheat the oven to 325 degrees F. Spray a 9×5-inch loaf pan with nonstick spray. In a small bowl, whisk together the flour, salt, baking soda, powder and cinnamon. In a large bowl, whisk together the eggs, olive oil, sugar and vanilla extract. Slowly add the dry ingredients to the wet and mix until the batter is smooth. 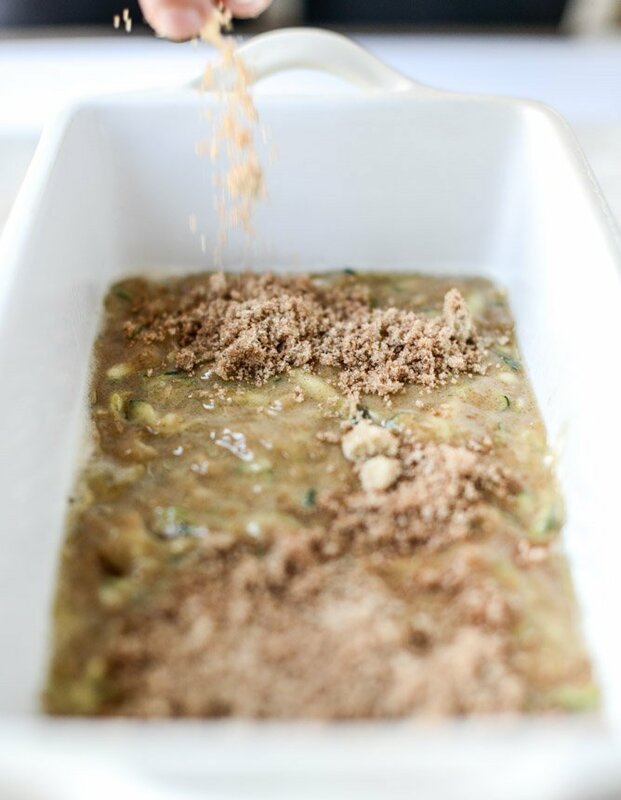 Stir in the grated zucchini. Spread half of the batter in the bottom of the loaf pan. Sprinkle the top with the filling mixture, then add the remaining batter on top. If needed, you can spray the back of a spoon with nonstick spray and spread out the top layer. Top the cake with the streusel mixture. Bake for 60 to 70 minutes, or until the center of the cake is no longer jiggly. Let cool completely (yeah… right) before slicing (or cutting)! Whisk the sugar and cinnamon together in a bowl. Combine all of the streusel ingredients in a bowl and mix with your hands until the butter is easily dispersed. You want the entire mixture to be moistened. Evenly sprinkle on top of the zucchini batter. *the cake and the toddler. Max looks delirious in enjoyment of that cake!! He’s lost in it. I don’t blame him. It looks beautiful, and I’m in love with the idea of cutting a loaf into squares! Sometimes things taste different when they’re in a different form. You know what I mean? Like pasta? They all taste a little different. This is the only way I want to eat veggies! Omg, I NEED some of this like now!!! Awww, and Max is so stinkin’ adorable!!! I also am loving that you broke rules here and cut it into squares, YUM! I was feeling al little hungry before I clicked on this post and now I am ravenous!!!! This bread looks so good. Going to make it for work snacks next week. Oh my gosh, Max is the cutest! And he is definitely your son – so adorable! Oh my goodness! This post is so sweet and that cake looks so delicious! That last picture of Max is the perfect selling shot for this recipe. The look of satisfaction in his eyes says it all! So cute!! I love that there’s zucchini in this! What a fun idea. Also love how minimal the ingredient list is. Baking ingredients can go overboard easily so it’s nice to see a simple recipe. Everything is better with a cinnamon swirl and streusel topping! This looks so good! And now I want to cut all of my loaf cakes into squares. Why haven’t we been doing this all along?!? Mmm lots of crumb, just how I like it! Love this! Looks amazing. Do you think this could be adapted for muffins? 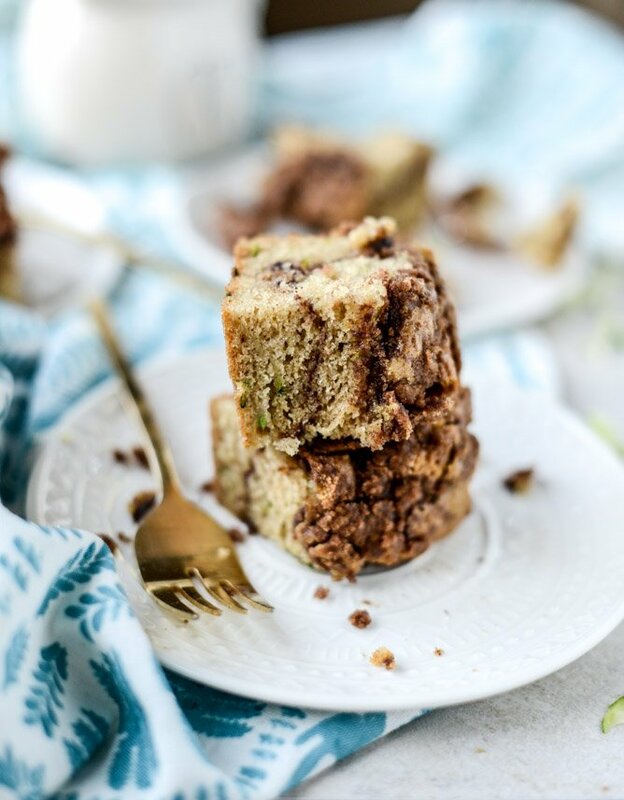 Well, hello there, zucchini bread coffee cake. Would you be so kind as to get into mah belly? Don’t be shy about it. GET INTO MAH BELLY!!! This looks sooo good, cake is definitely improved with the addition of cinnamon sugar swirl and streusel! So two thoughts: 1) I think “reruns” will go the way of “hanging up the phone” as in kids won’t get why that phrase exists in a few years, and 2) I used to think that all coffee cakes actually contained coffee. Too bad they don’t amirite? I still haven’t tried any kind of zucchini bread/cake, and I feel like I really have to. I love vegetables in other baked goods, particularly pumpkin and beets, so I think I’d like this too. Thanks for the idea! hey girl this looks really tasty! Love the pic of Max! so cute! where did you get those measuring cups from? Love them. And the recipe. I think I’m going to make this for Arthur this weekend!!! Just need to get my hands on a few zucchini – or maybe I’ll do it with banana bread instead. GAH! I just need any excuse to eat that streusel right now. I love how well you transform zucchini! This looks amazing. I’ll have to make it with the last of the late summer zucchini harvest! How many zucchini yielded a cup? I’m going to make this very soon! It looks and sounds amazing! zucchini in this cake. Cinnamon swirl is a great idea, that’s for sure. Looks delicious! So I made this and it did not turn out good. It seems like too much filling and streusel because it became hard. I think I will try to make again. This looks amazing, hope my kids find it tasty ! Grace, I had the same issue! I was using an 8.5 x 4.5 loaf pan, so I knew it would take a little longer. After 85 minutes, it STILL was raw in the middle and our house was not having the oven on any longer in the Texas heat! Jessica-any suggestions? We ended up throwing it out, but it looks too good and we want to try it again! I Would “dry out” the grated zucchini. Once grated, put it in a kitchen towel and squeeze gently to remove any excess water from the zucchini. that should help. Good luck. I have not tried it, but will very sooonnnn. Made this tonight and had a massive piece while it was still warm. That photo of Max is pretty much exactly what I looked like while eating it. Ridiculous, just TOO good. Hum… why is this called a “coffee” cake if there is no coffee in the recipe ?? ?